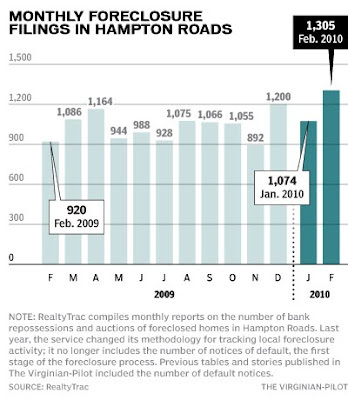 What are the latest foreclosure numbers in Hampton Roads? How does Hampton Roads compare with the national numbers for foreclosures? This past February, First American Core Logic came up with some interesting national figures that said at the end of 4th Qtr 2009, 11.3 M homeowners owed more than their home is worth and that this represents 24% of all residential properties with mortgages! Nationally, 1 out of 4 homeowners are underwater, meaning that they have negative equity. Equity is the current market value of the house less any financial obligations/loans owed on the property. According to RealtyTrac.com, total foreclosure filings for February were 308,524--this represents a 2% decrease from January but a 6% increase from February last year. Foreclosure filings in our area stood at an all time high in February with 1305 in number up from 1074 in January. Courtesy of RealtyTrac and the US Census data, we see the following foreclosure rate per city: The foreclosure rate is for month of February 2010. Are you interested in finding out more about foreclosures where you live? Sign up to receive your FREE Foreclosure list!